A little dusting of snow graced the ground Monday morning. It was cloudy and light snow fell outside all morning. I wanted to go out for a run, but figured I’d work and squeeze a run in after noon. Come noon, the clouds parted and the sun shone through the windows. Squinting up valley, I frowned at the brightness. I prefer to run on cloudy days – I’m just not a fan of the sun. Returning to my desk, I worked a few more hours until the shadows on the window blinds disappeared into a uniform grey. Huh, the clouds must have returned, I thought as I stepped out to the deck for a look. Not only did they return, but the house – the whole town – was enshrouded in clouds. There were 90 minutes before sunset, so I ran upstairs to don my running tights and top. Out the door, I stepped into a cool, damp soup. The temperature was already dropping to 29°F as I pulled glove liners on. Funny how in February, 20°F feels like a heat wave, but in early autumn I have to get dialed into the cooler temperatures all over again. Mist and fog muted all of the normal sounds around me except for the crunch crunch crunch of my feet on the snow or frozen dirt and rocks. My eyes darted all over the trail – into the woods to avoid spooking large mammals and on the forested slopes above to spot any predators. Snowflakes drifted lazily down through the still air, landing on my forehead, nose, and cheeks. I like running alone on empty trails because I can zig and zag as I try to catch a snowflake in my open mouth or high-five all of the tree branches lining the trail. It’s my second favorite part of trail running. My favorite part is when I am done running. It’s unclear how much longer we’ll be running before we can transition to skiing. All of the snow enthusiasts hope it won’t be long. The most important thing is to remain active outside, because I need to get my winter mojo back. But really, MY winter mojo has never really left. It’s all relative. Meanwhile, I’m getting my cold weather kitchen mojo on. Some dark, leafy greens like kale and chard are in season now, but I can only handle so much before I want other greens. 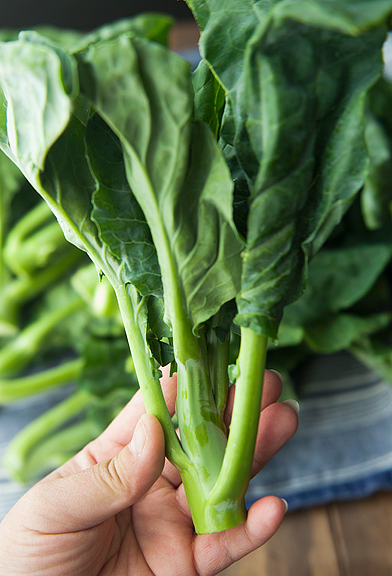 Chinese broccoli or gai lan is available at most Asian grocery stores. It’s one of the only green vegetables they serve at dim sum and I always order a plate on principle to balance all of the fatty, starchy (and delicious) other dishes. 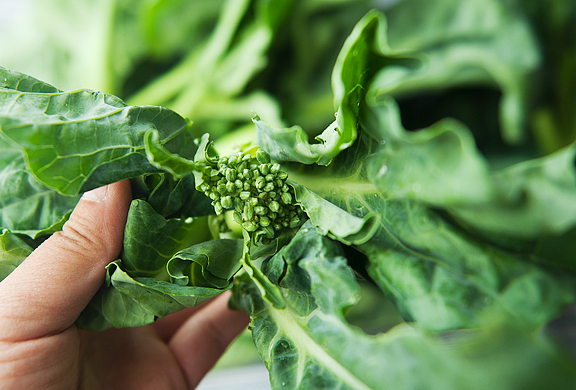 I consider myself fortunate to have grown up eating a lot of different kinds of greens. Mom always made sure we had lots of vegetables in our meals and now I do too. And while I love regular broccoli, I find Chinese broccoli to be slightly sweeter and more tender than its western cousin. Not to mention, I absolutely love the leaves. That’s my favorite part. 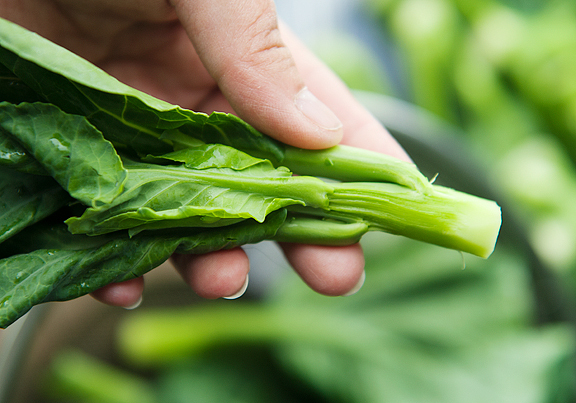 With Chinese broccoli, you get greater leaf quantity and a more tender stalk. Choose stalks that are slender and young. Avoid tough, large leaves. For each stem, I pull off the lowermost leaves (they get cooked too) and trim the thick outer skin at the base of each stalk. They don’t do this in restaurants, but it’s a habit I picked up from my grandma and my mom. It’s totally okay to skip that step if you are cool with the fibrous skin. My preference is to braise the broccoli rather than blanch it because braising has more flavor. But if you’re watching calories or want the easiest preparation method, then I suppose blanching is an acceptable substitute. Even so, braising doesn’t require that much more effort. It’s a quick sauté in oil and then simmer in some chicken broth. 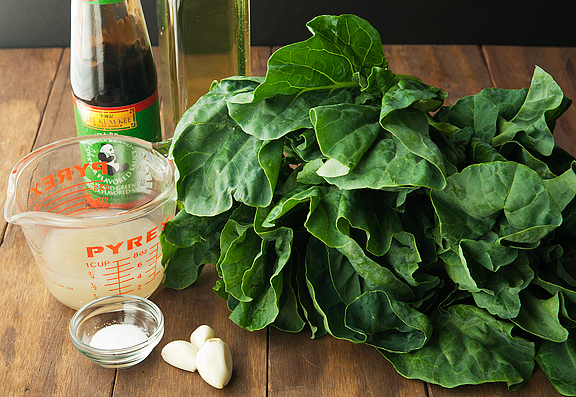 Regardless of how you prepare the greens, the final step is to drizzle some oyster sauce over it. This tastes best when the broccoli is hot. 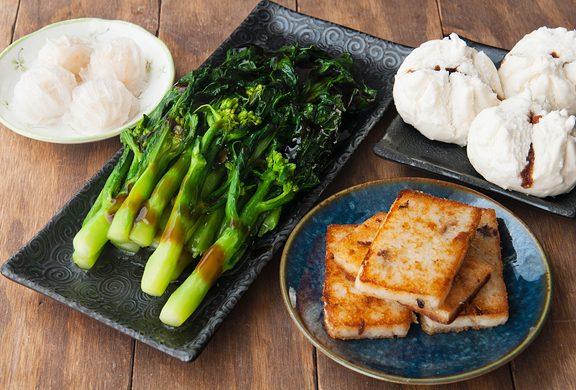 Sometimes I serve Chinese broccoli as a side vegetable when we eat Chinese food. Other times I like to eat it with congee (Chinese rice porridge). On the rare occasion that we have dim sum at home (sometimes homemade, sometimes purchased from the Chinese grocery store), I insist on a plate of Chinese broccoli. 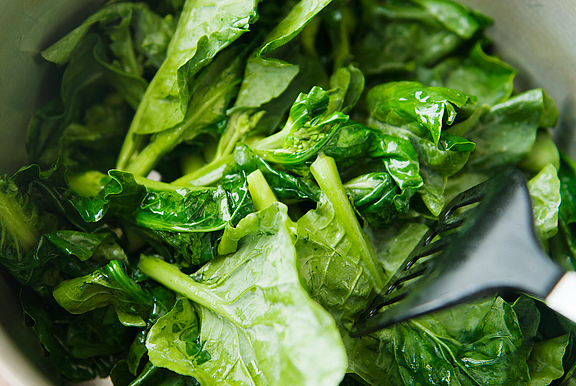 It’s good for you, it adds a beautiful splash of green to the table, and it is delicious – a favorite green in this house. 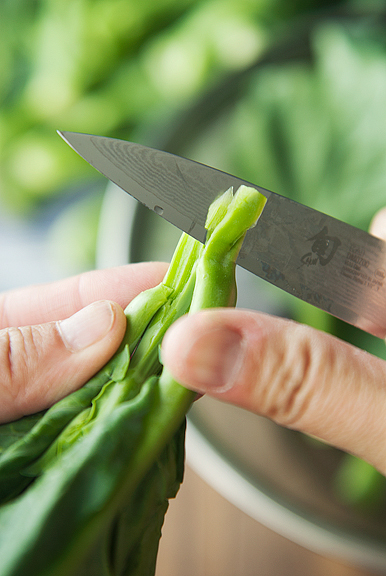 Wash the Chinese broccoli and trim (optional) the tough skin from the base of each stalk. 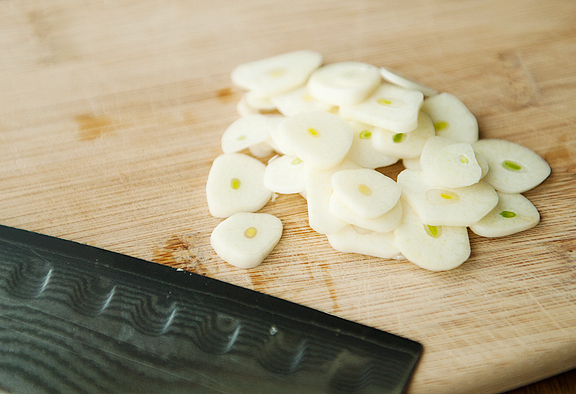 Heat the vegetable oil in a large sauté pan or stock pot over medium high heat. 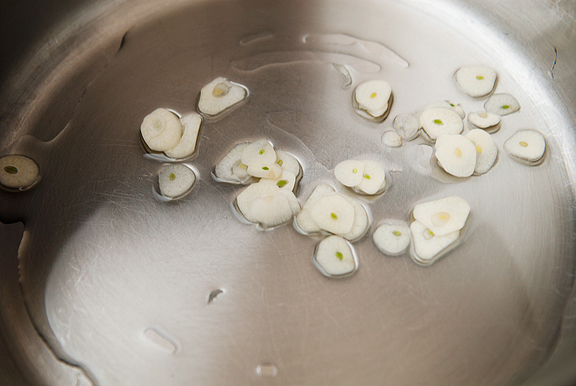 Add the garlic when the oil is hot and stir it around until the oil becomes fragrant (about 30 seconds to a minute). 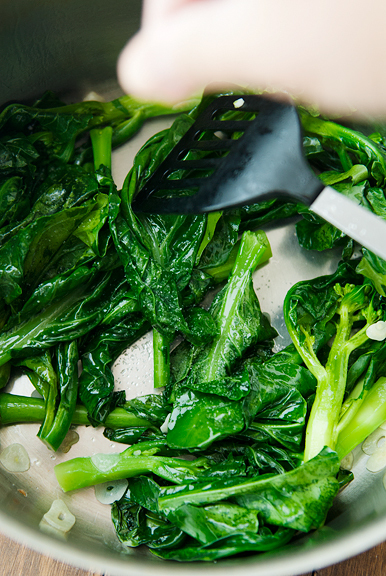 Add the Chinese broccoli all at once (careful – it can splatter if it’s really wet). Sprinkle with salt and sauté until the green leaves are mostly wilted. Pour the chicken broth into the pan and let it simmer down until all of the stalks are a deep green color (add more broth as needed). 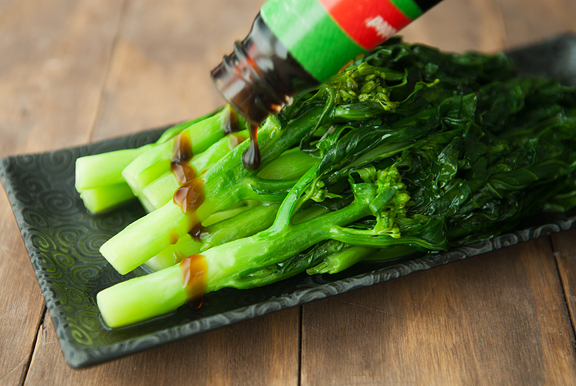 Remove the Chinese broccoli to a plate and drizzle with oyster sauce. Serves 4 as a side dish or for dim sum. 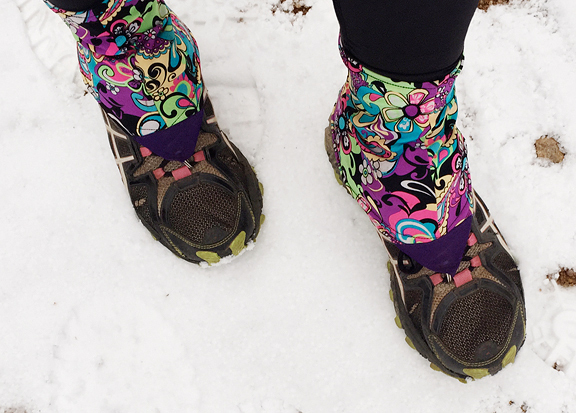 I absolutely love your description of running in the snow! Makes me want to jump on a plane and go somewhere where they have snow and run in it. As if I needed another reason not to run: the word “predators”! I don’t think I’ve ever had Chinese broccoli, but we are big broccoli fans in our house, so I look forward to trying it! Can you please explain to me about your footwear? I haven’t seen those before, so I’m not sure what I’m looking at. Are those anklewarmers that fit on the lower part of your ankles and across the top of your shoe? OH MY GOSH!!!!!!!!! I am so drooling all over this right now….I need to go SF! Right now. I have seen your recipe for BBQ pork buns, and I was blown away. 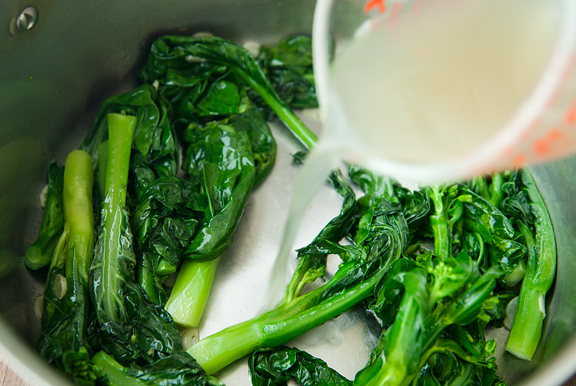 The chinese broccoli is so delicious and easy to make. You make crave for it now. Happy Thursday and enjoy zig zagging in the snow. I am busy indoors studying biochemistry of nutrition. blah! Enjoyed hearing about your run here; we think alike. I just returned from my sprint-walk in a downpour. Drops managed to bypass the hood and give me refreshing kisses. Rain sheeted down my coat and down my legs. My runners became squishy. No sweat: I loved every minute of it and was dry and cozy within minutes afterwards. Know what you mean about empty trails–not a soul to interfere with my daydreaming, no one to ground me. A day without a walk (or run or your favourite drill), is a day not alive with joy. Ohh man, have you seen this video? I don’t order vegetables when I go out to dim sum, because I can make them at home and am apparently too savvy to buy them. But these look awesome and I will make them any day! Lynn – oh, I just mean mountain lions – but we don’t get too many around here (most of them are quite shy). Kristin – I hope you can find some where you are! Try an Asian market. Pey-Lih – you guys should have decent access to dim sum where you are!